British High Commissioner Greg Quinn has called for more support and assistance for abused women and children here even as he urged the country’s citizenry to speak out when they become aware of such acts. “People should speak out when they become aware of such abuse and there needs to be better assistance and support for victims,” Quinn said last Wednesday evening. The event, a reception hosted by Quinn and his wife Wendy, to mark the 90th birth anniversary of Queen Elizabeth, had in attendance President David Granger, ministers of government and parliamentarians among others. Expressing his continued sadness and anger at the abuse of this nation’s women and children, the British envoy stressed that the social violence was unacceptable and disgraceful. 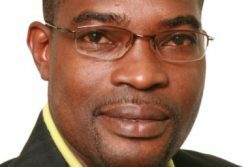 “It should bring shame on those who perpetrate it and those who protect such individuals…this abuse has no place in a modern, democratic Guyana. I support any and all actions by Government and civil society to eradicate this scourge,” the High Commissioner declared. 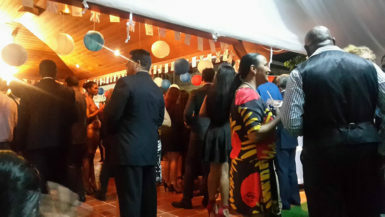 At the reception, which coincided with his own birthday, Quinn reflected on a year that has not only seen Guyana celebrate 50 years of independence but saw a series of visits and developments in the relationship between the two countries. He pointed to, among the projects and programmes, the launch of the UK Caribbean Infrastructure Fund, worth some £53 million or $16 billion to Guyana, that government has said will be used for bridges, roads and ports. Quinn pointed out that it is grant money that does not have to be repaid. “2016 has been a year of firsts for the UK-Guyana relationship. In April we saw the first visit by a Royal Navy ship to Guyana since 2001 and in May we saw the first visit by a Minister from the Foreign and Commonwealth Office since 2002…What I do think this shows is that the relationship between our two countries is in good shape. And it’s not just about the visits. There is much of substance,” Quinn asserted. Turning to the issue of the death penalty here, the High Commissioner reaffirmed his government’s stance that the aforementioned form of punishment be abolished. “When the Foreign and Commonwealth Office Minister James Duddridge was in Georgetown on 31 May he spoke clearly on the topic when he said: ‘The British Government’s position is that the death penalty is inappropriate for any crime that has been committed.’ That is a clear message and I look forward to the day when Guyana abolishes the death penalty from its statute books,” he stated. President Granger in his address thanked Britain for its continued support of Guyana’s sovereignty and territorial integrity even as the country “yearns” for a complete resolution to Venezuela’s “obnoxious” claim of her lands. “We were heartened, therefore, by the unambiguous asseverations of the Parliamentary Under-Secretary of State, at the Foreign and Commonwealth Office, who iterated that the Guyana Venezuela boundary was fixed in the 1899 Arbitral Tribunal” award and that the UK supports the territorial integrity of Guyana, unequivocally, Granger said. “We are reassured by the reaffirmation of the United Kingdom’s support for Guyana’s position on the attempts by the Bolivarian Republic of Venezuela to overturn previously settled borders…Guyana is gratified by the quality of cordial relations with Britain. We thank Britain for its sustained support for Guyana’s development efforts,” he added.